Best Buy's Black Friday catalogue has popped up online, and amidst the bargains is an interesting offer from Nintendo: a DSi console that comes with downloadable DSiWare pre-installed on the machine. There will be two bundles available, each with five games included on the system. 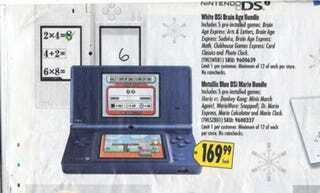 One includes a white DSi with three Brain Age Express titles, Clubhouse Games and Photo Clock. The other has a blue DSi with Mario vs Donkey Kong: Minis March Again!, WarioWare: Snapped, Dr. Mario Express, Mario Calculator and Mario Clock. Both are advertised at $169.99. It's unclear whether it's an offer that will be extended beyond Black Friday; we've contacted Nintendo, and will update if we hear back.